Looking back, I shudder at my own naivety in imagining firstly that I could do this, and secondly that after the first few posts I believed I had run out of things to say already. But the last five years have seen a slight increase in my technological skills, and a more impressive development in awareness of and understanding about children’s violence to parents, not just in the UK but right around the world. On my watch there have been two large research projects in Britain and Europe; four books published specifically about children’s violence to parents – and others at various stages of completion; a number of major reports, including that into adoption disruption in Britain and family violence in Australia; campaigns to change the law; international conferences linking research around the world; and in-numerable journal articles, Ph.D. and Masters dissertations. And that’s just what I know about. I am acutely aware that I probably miss huge swathes of work around the world, because of my search terms, personal contacts or language issues. In terms of practice, we now have full evaluations of a number of approaches to working with families, which enable practitioners to work more confidently and appropriately, and families to identify a possible response. What is clear though is that as we move forward and the complexities of the subject open up, we become more aware of nuance, less confident in generalisations. Whether with regard to the development of violence and abuse, or in terms of support systems for families in effecting change, there is no ‘one answer’. Individuals are complex, family life is complex. As Cottrell stated so clearly in 2004, when we search for commonalities, it boils down to the parents’ despair and self blame. I am thankful to the various groups of people who keep me on my toes in this regard, whether via twitter or in other ways, “yes, maybe, but what about ….”. My site is heavily skewed to English speaking work (with a nod to Spain), and for this I can but apologise. I welcome contributions from everywhere and anywhere and am always pleased to hear from individuals wishing to post guest blogs or research papers, or advertise events. As I have said many times, I am not an expert by experience or practice, but I do listen, and this seems to be one of the most important things to be doing in this field of work. For the next months and year ahead I look forward to conversations and working parties particularly about young people with additional / special needs. I have conference bookings and an imminent piece of work as part of an online CPD programme. And then of course there is the book! I count myself privileged to be part of this community and look forward to more years ahead. Thank you! 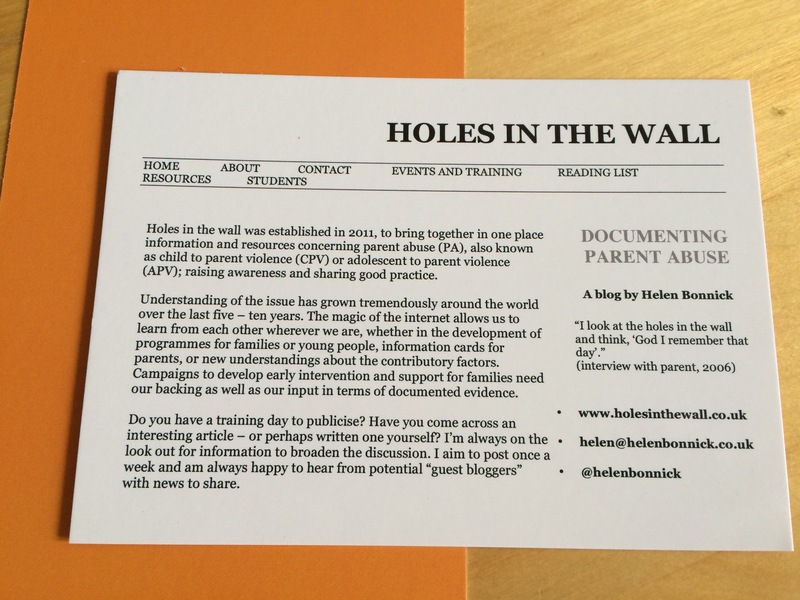 Well done Helen – Happy Fifth Birthday to Holes in the Wall. Please continue the brilliant work.